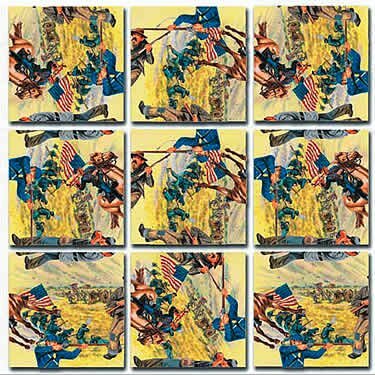 The American Civil War, also referred to as “The War Between The States,” was an enormous conflict between regional philosophies, politics, economics and cultures that literally tore apart the fabric of the United States of America and stitched it back together into a much different and stronger cloth. The Civil War was at once the nightmare and the rebirth of the American Dream. It was the crossroads of America’s idealistic journey toward representative democracy and free enterprise. Slavery was a vital resource of the agrarian economy of the Southern states, where cotton was the principle crop. Almost 4 million slaves toiled in the South’s rural cotton, tobacco, sugar, rice and indigo plantations or worked as servants. There were only approximately 6 million whites in this vast region of the country. The South had few cities and very little manufacturing. Life was highly ordered, slow paced, peaceful and, for the landlords, pleasant. The Northern states, on the other hand, had 18 million people, a booming industrial revolution, a constant flow of European immigrants seeking prosperity in its many expanding cities and a thriving independent farming industry that was feeding its increasing population. As the United States expanded westward with the Louisiana Purchase, the competition to settle the new territories brought machines and independent farmers from the North whose pioneers were vehemently opposed to having to compete with the slave labor of the wealthy land barons from the South. When Missouri requested in 1819 that it be admitted into the Union as a slave state, the struggle between the cultures and economies of the North and South regions of the country clashed on common ground. In an attempt to avoid a conflict with Missouri, which was north of the Mason-Dixon line defining the boundary between the North and the South, Congress granted Missouri statehood as a slave state. When the United States won its war with Mexico 30 years later and claimed the vast new territories of Texas, New Mexico, Utah and California, the entrepreneurial North wanted the entire new territory to be free of slavery, and the South became even more united in defiant protection of its way of life. On December 20, 1860, South Carolina seceded from the Union and was followed within a month by Alabama, Florida, Georgia, Louisiana and Mississippi. These six states met in Montgomery, Alabama and formed the Confederate States of America, which Texas joined almost immediately. On February 18, 1861, the provisional Congress of the Confederate States appointed Jefferson Davis to be its provisional president. When Abraham Lincoln was inaugurated as the 16th President of the United States on March 4, 1861, he declared the secession of the Southern states void and ordered Union troops to federal garrisons in the South. At 4:30 a.m. on April 12, 1861, Confederate General Pierre Gustave Toutant Beauregard launched a 34 hour bombardment on the troops that Lincoln had ordered to Fort Sumter, South Carolina. The fort surrendered with no casualties on either side, an ironic bloodless beginning to the bloodiest and bitterest war in American history. Five days after the Union surrendered Fort Sumter, Virginia seceded. Arkansas, Tennessee and Virginia then joined the Confederacy. The people in the mountain regions of western Virginia chose to side with the Union and form the new state of West Virginia, which included within its borders the historic site of Abolitionist John Brown’s 1859 raid to arm the slaves at Harpers Ferry. North Carolina was the last state to secede. President Lincoln issued The Emancipation Proclamation on September 22, 1862, ordering all slaves to be free as of January 1, 1863, and even family loyalties became divided. Three of Mrs. Lincoln’s own brothers were killed fighting against the Union for the Confederacy. At the height of this bloody struggle, President Lincoln traveled to the site of the biggest and bloodiest battle of the war, Gettysburg, Pennsylvania, and on November 19, 1863, delivered his “Gettysburg Address,” a short, poetic and profound speech which inspired the nation. Ulysses S. Grant, rose from commander of a volunteer Illinois regiment to become Lincoln’s General-in-Chief of the Union military forces. Grant’s brilliant victory at Vicksburg, Mississippi split the Confederacy in two. In March, 1864, Grant engaged Confederate General Robert E. Lee’s forces in northern Virginia and ordered General Sherman to march behind Lee through the South to the sea. Sherman conquered and ruthlessly burned everything, including Atlanta, along the way. Lee surrendered the Confederacy to Grant at Appomattox Court House, Virginia on April 9, 1865. Five days later, on April 14, 1865, President Lincoln, while attending a performance at Ford’s Theater in Washington, D.C., was shot and mortally wounded by John Wilkes Booth, an actor from Maryland who sought to avenge the defeat of the Confederacy. The most violent period in American history had come to an end.